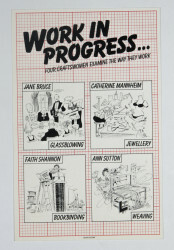 Crafts Council exhibition publication titled 'Faith Shannon: Bookbinding' from the series 'Work in Progress: four craftswomen examine the way they work'. 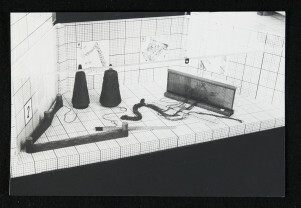 This publication was designed by Design Systems and includes photographs by M. Woodward and drawings by Roger Bowles. The cartoon on the front cover is by Bill Tidy. 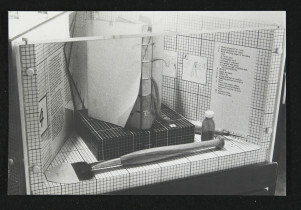 Typeset by Afal (Cardiff) and printed by Cwnbran Litho. 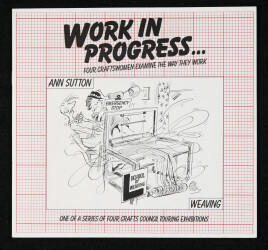 This publication includes information relating to Faith Shannon and her bookbinding practice.